The Pangaea Polished Concrete Veneer (PCV) is a real game changer in the decorative concrete world. 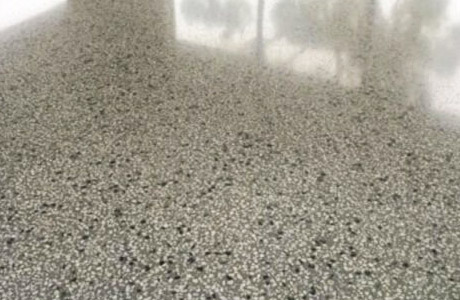 Prior to the creation of the PCV system, if a customer wanted the look of finely polished concrete, yet had a different type of original flooring, a 10-20mm concrete screed was installed and then polished. The weight and thickness of the concrete screed often made installation unsafe or impossible. Pangaea PCV allows consumers the ability to enjoy the look of beautiful polished concrete virtually anywhere in their home or business. Pangaea PCV flooring is a cement based compound enhanced with polymers. Our certified installation specialists mix the Pangaea compound in small batches at the installation site and apply it, with hand trowels, to an existing sound substrate. The veneer is typically only 10mm to 15mm thick, so it does not obstruct doors opening and closing. The surface must cure three hours before it is safe for walking; it takes between eight and 24 hours of curing time before we can grind and polish your new surface to whatever level of shine you like. We offer a large variety of colours so you can choose the shade that best enhances the surroundings. The PCV material made of over 50% natural stone, so it is kind to the environment. We offer genuine Pangaea flooring which is strong and durable; Pangaea offers a 10-year warranty on defective products. There are different styles and finishes to compliment your surrounding décor. We strongly recommend installing PVC flooring on indoor surfaces. We have installed Pangaea flooring in homes, offices, churches, and shopping centres. If you would like to use this type of flooring outdoors, we recommend installing it only under protected or partially enclosed areas such as a carport or a covered patio.